So if you hadn’t guessed it by now, I love top ten lists. This is not the first I’ve done on this site, and won’t be the last, but it might be the one the most fans can relate to, given how memorable Superman’s appearances in film have been over the years. First off, a couple of notes about how I compiled the list: 1) The movie had to have been released in theaters, no matter how brief. 2) I’m only ranking live action movies, so unfortunately the well-received “Death of Superman” and “Reign of the Supermen” animated features don’t count, even though they did have a special release in theaters last year. 3) I’ve only selected feature-length films to rank, so unfortunately George Reeves’ first turn as the Man of Steel, “Superman and the Mole Men,” doesn’t qualify either. At a 58 minute run time, it doesn’t exactly scream “movie” to me, especially given that it even aired as a two-partner for the “Adventures of Superman” show later on. As such, it’s more of a glorified television episode. The other bit to note, and it’s probably the elephant in the room, is that these are the only Superman movies ever made, but who cares?! Until WB and DC get their act together, we’ll go with what we have. As of two years ago, there have been ten. If you feel different, please let me know in the comments! With that said, let’s get to it! 10) Supergirl (1984) I know what you’re thinking. 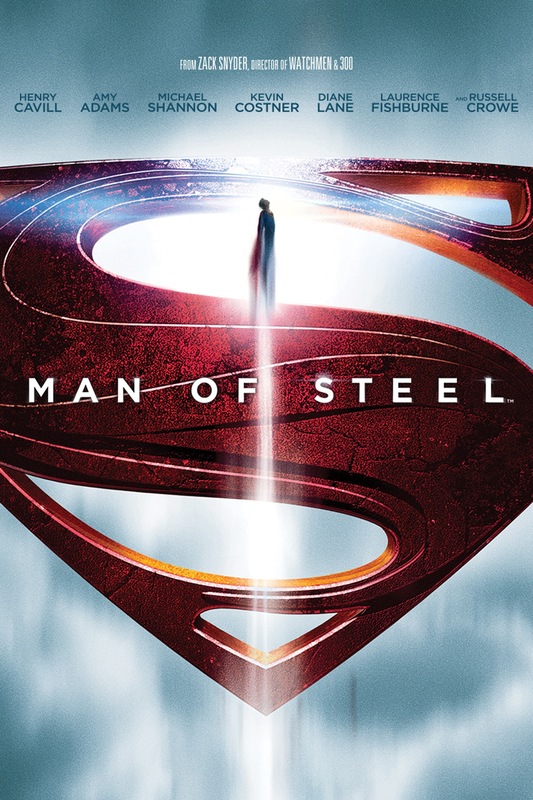 This is technically not a Superman movie, per se, and you’re right. Yes, he’s mentioned, and yes he appears on a poster in Lucy Lane’s college dorm, but never actually appears. And you wouldn’t be wrong. Still, it is considered canon in the Reeve films, and I really wanted to include all five of those on this list. Let’s be honest, Supergirl is a terrible movie that deserves a lot of the criticism it gets. So much of it doesn’t make any sense, including key moments that are critical to the story. There are plot holes galore and even the A-list actors who agreed to participate in it- Peter O’Toole and Faye Dunaway, both Oscar winners and legends of cinema in their own right- couldn’t save it. 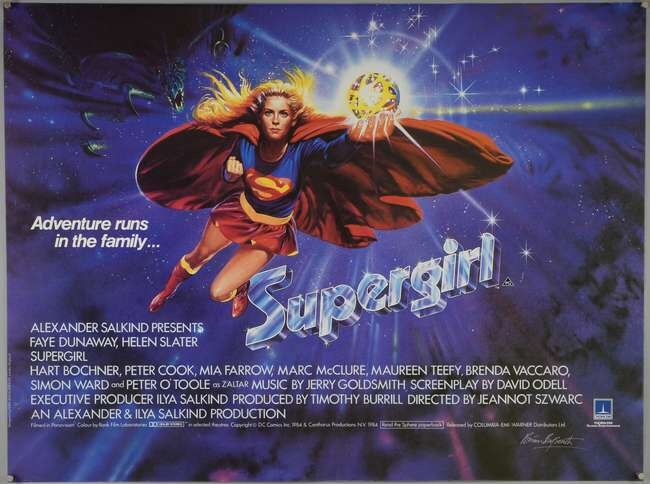 Watching it again recently for the first time in years, however, I can’t help but be won over by the ineffable charm of Helen Slater in the title role. There’s never an explanation of how she gets her powers or how they work, or even how she’s related to Superman, despite referring to him as her cousin throughout the movie. And yet I’m still invested in the film and want Kara to succeed. Slater just brightens up the screen every time she’s on it, and lifts every bit of dialogue and cliche out of its mire. I believe she’s Supergirl, and she makes the movie fun to watch. Comics legend Jack Kirby once said that if you make a reader love the characters, they’ll go with them anywhere. That’s basically what happens here. 9) Man of Steel (2013) After trying and failing to start a new Superman franchise with Superman Returns, WB made the unfortunate misstep that was the Snyderverse, which began here (more on that further down). Man of Steel isn’t a bad movie necessarily. I actually think there are some wonderful visual qualities to it- Superman’s costume is great, right down to the shimmering red cape, and maybe the best we’ve seen committed to celluloid. The Greco-Roman Krypton is also pretty cool, the acting is top notch, and the theological metaphors are captivating. It might have worked with a different character or in a different genre. Ultimately though, I thought it was a poor Superman film. Superman should never be a killer, he should be above that. It’s what separates a superhero from a generic action hero- one is a role model, the other isn’t. I realize fully that over the course of the character’s eight decades of existence, there have been a handful of instances where he has taken life, but only in an ENTIRELY morally inescapable situation. None of the fights with Zod in Man of Steel were such a situation, nor was the choice to have such an ethical dilemma in an origin story!! It would have been a hard sell in a third or fourth installment of a Superman series, but why the execs, filmmakers or whoever wanted to do it this way is beyond me. On top of that, I hate seeing Superman as a character who’s trying to find himself, but that’s just me. Some might like the lost, confused person discovering their identity. Not my cup of tea. If you want to do that, can he be a teenager or younger, and not an adult? This is an instance when I would have looked across the street at the MCU’s perfect characterization of Steve Rogers for how this character should work. Clark Kent for much of this film resembled Wolverine more than Superman, and that for me is a problem. There’s a lot more I could say about this film and what I didn’t like, but since we’ve been over this a gajillion times on the internet in the last six years, I’ll just conclude by saying a few positives. Henry Cavill is an awesome Superman and I would love to see him given a chance to do more. With the right script and right director, I think he could be part of an incredible movie. Come on, WB!!! Make it happen!! 8. Superman III (1983) I wrote my thoughts about this one a few months ago, so I won’t overstate anything here, but in a nutshell, although Superman III was the worst of the four Christopher Reeve films, the movie did have a couple of redeeming qualities. I actually found the scenes in Smallville with Lana Lang to be wonderfully charming, as Reeve and Annette O’Toole have surprisingly good chemistry. The iconic fight between Clark Kent and “evil Superman” was actually really cool and very well put together at a key moment in the story. Outside of those two and a few other nice qualities, the movie is severely hampered by more Richard Lester hokiness and Richard Pryor falling all over himself. By this point the chasm of quality between directors Richard Donner and Richard Lester was never more apparent, and the Superman film franchise had declined severely. It was as if someone had made a choice to go from actually taking superheroes seriously and revert to comedy and slapstick. Not a great choice. 7. Justice League (2017) We finally got a Superman we recognized. ‘Nuff said. 6. 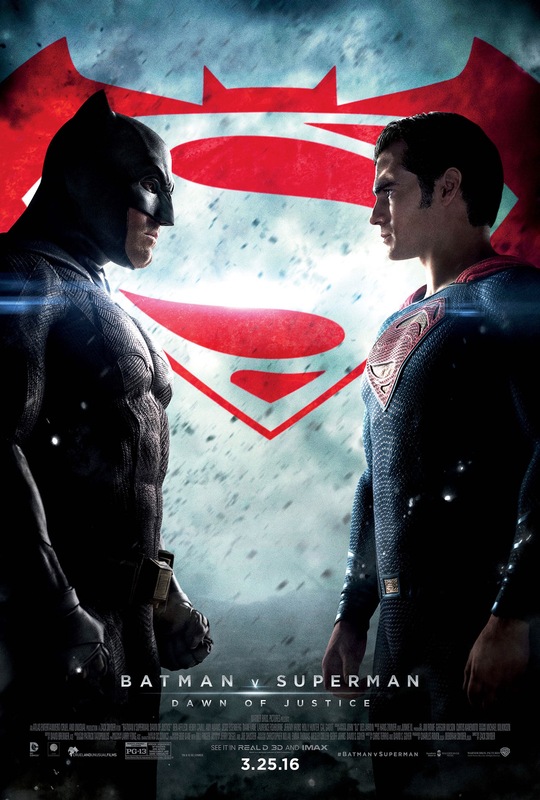 Batman vs Superman: Dawn of Justice (2015) Okay, hear me out here. I recognize that this was not a good superhero movie, or even movie, period. It had enormous plot holes, super thin motivation for the characters and a dour, somber theme that really, really doesn’t work with Superman, generally speaking, certainly not as a constant approach. And yet, from the standpoint of spectacle alone, I thought this movie was actually a pretty fun ride. Whatever else you can say about it- and there is plenty- you had the first ever team up on film of arguably the three most iconic superheroes ever created. That alone should count for something. On top of that, the three characters themselves were actually pretty decent. I’m not a big fan of Snyder’s interpretation of the DC Universe, but one thing you can say with certainty is that his gift to it was his casting choices (well, some of his casting choices). Henry Cavill and Gal Gadot, in particular, are two actors who should play their respective characters for a very long time. Even Ben Affleck, whose casting made me wince when I first read it, ultimately wasn’t that bad. In fact, for me he is the only actor to pull off a solid Batman AND Bruce Wayne. Was it a great film? No. But all I know is by the end of it, I was sitting in a movie theater watching a live action Superman, Batman and Wonder Woman fighting Doomsday, with phenomenal music, screeching sounds and great special effects. At that moment, I didn’t care what else was going on, I was just in it for the ride. And sometimes just that much is perfectly okay. 5. Superman IV: The Quest for Peace (1987) From here on up on this list, I consider the movies to be good. Yes, that even includes Superman IV. This movie flopped at the box office when released and has generated so much ire amongst fans who couldn’t get past the lousy effects and shoestring budget. Canon’s release of this movie was really the nail in the coffin for the entire Christopher Reeve Superman franchise, and one that the character still has yet to recover from, in many ways. And yet watching this movie again recently, I couldn’t help but genuinely enjoy a lot of things about it. Kryptonian crystal images in the Fortress of Solitude are back after a hiatus in SIII, Lex Luthor is back and, in my opinion, better in many ways than his first two outings. Margot Kidder also returns and Lois Lane is again a featured character. But I think my favorite part about this movie is the heart of the film itself- Superman trying to eliminate all nuclear weapons on earth. It’s just such a Superman thing to do: noble, idealistic, and in this case topical, given the climate of the late 80s, which saw the end of the Cold War. Chris Reeve himself pushed and financed a good deal of this film just to get it made, and it was also his vision to have the movie revolve around Superman’s quest for peace. It’s unfortunate that the film didn’t quite land. While it still has its limitations, I think there’s enough in Superman IV to make it a worthwhile watch, and a decent movie (click here for a recent retrospective I did). There is a lot to like, if not love about Superman II. This movie was a payoff for storylines which began in the first Superman, and good ones at that. 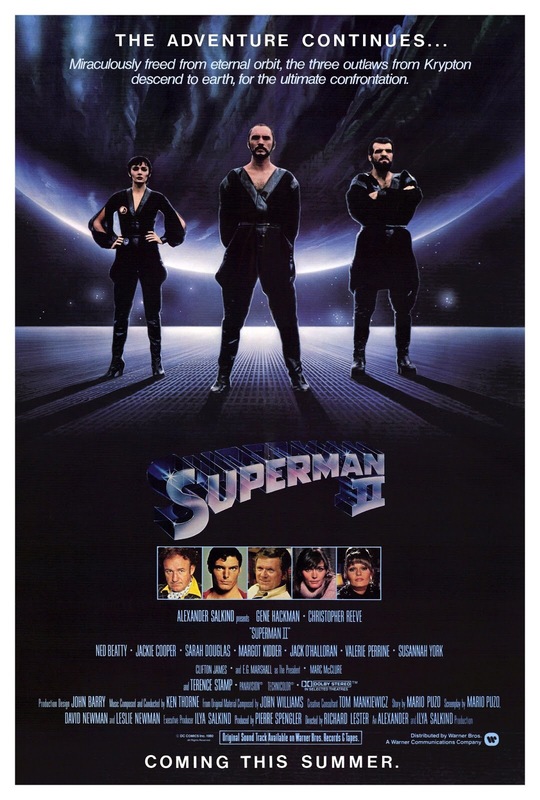 Three criminals- the now iconic General Zod, Ursa and Non- who were sentenced to the Phantom Zone by Superman’s father, Jor-El, come back seeking revenge on their jailor’s son. Along the way, the trio land on earth and acquire the same powers imbued on all Kryptonians by a yellow sun, and you have the makings of an instant classic. In no other movie has Superman had this caliber of a threat, one that can go toe to toe with him on a level of pure power. It provides for excellent drama, especially with Clark and Lois’ evolving relationship in the background. The problem for me about this film though, is one which has been well documented over the last four decades: the transition of directors before the film’s completion (and years before Snyder and Whedon). Richard Lester, brought on by Ilya and Alexander Salkind after the producers’ falling out with Richard Donner, had a completely different style that clashed with the previous one. Where Donner embraced the epic, almost biblical drama of the story with sweeping landscapes and heartwrenching moments, Lester’s forte was slapstick humor. While some may have enjoyed this, I found it to bring the film down a great deal. All in all though, an enjoyable film but not without its flaws (more on that later!). 3. 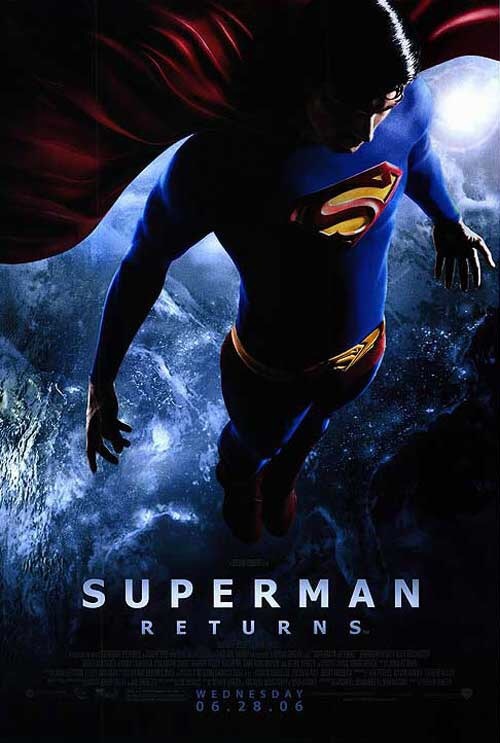 Superman Returns (2006) I am an unabashed fan of this movie and have been since I saw it in the theater. The tone of the film is so pitch perfect for Superman and one I wish more filmmakers would emulate: uplifting, positive, and bright. Superman smiles. He is a role model, and people love him. There are those who thought that this style wouldn’t work in the 70s, and yet it did. There are those who say say it can’t now either, but for me it does just as well. Pluses include Kevin Spacey’s performance as an eccentric but brilliant Lex Luthor, Frank Langela’s underrated Perry White, and Bryan Singer’s economic filming style which allows the movie to flow beautifully. The film looks very polished and has great effects which work for the service of the story. It has a great score, and doesn’t shy away from being fun and positive. Bryan Singer’s love of Richard Donner and Christopher Reeve is also very apparent, and gives loving nods to their films without overwhelming his. The flaws of the film are minor for me, but do hold it back after subsequent viewings. Singer’s choice of casting a young Superman and Lois Lane in the hopes of future sequels strains believability. Brandon Routh and Kate Bosworth are fine actors who play their roles capably, but they are much too young to feature in a film which takes place after a supposed five year break, much less play parents of a boy who looks ten years old. The idea of Superman and Lois Lane having a son wasn’t as big a deal for me as it was for others, I actually thought it was intriguing given that Singer meant for this film to be a sequel to Superman II. Whether it succeeded in that regard is up to each viewer, however. All in all, there is a lot that I love about Superman Returns. It’s unfortunate that the movie’s returns ( 😉 ) weren’t enough to warrant an ongoing franchise. Elements of what Singer had planned for a potential sequel were eventually incorporated into Man of Steel, but I would have been interested to see where Singer would have taken the story. At least we’ll always have the airplane rescue. 2. Superman II: The Richard Donner Cut (2006) Released to coincide with Superman Returns, the first Superman movie since 1987, fans who had been clamoring for the Donner cut of Superman II were finally heard. Lovingly curated by Michael Thau and overseen by Donner himself, this cut of Superman II incorporated large amounts of footage initially unused by the studio when the reins were handed to Richard Lester. Of the new footage, shot predominantly by Richard Donner before parting ways with the Salkinds, most, if not all, had a serious tone more in keeping with the first Superman movie of ‘78. Gone was much of the campiness which had been included in Lester’s theatrical cut, replaced by what Richard Lester would compare to a David Lean film. Rights to additional footage of Jor-El in the Fortress of Solitude were secured from Marlon Brando’s estate that weren’t in the theatrical cut at all (legalities prevented Brando’s likeness from being in the film at all, hence the scenes with Lara in the original release). The final product feels more in line with the tone of the first Superman, and one which I personally enjoyed thoroughly. Superman II: The Donner Cut unfortunately does feel a bit disjointed, however. There is even a preface in the beginning of the film saying that some of the originally intended scenes were never shot, and as a result test footage was used in some cases to complete the overall story. 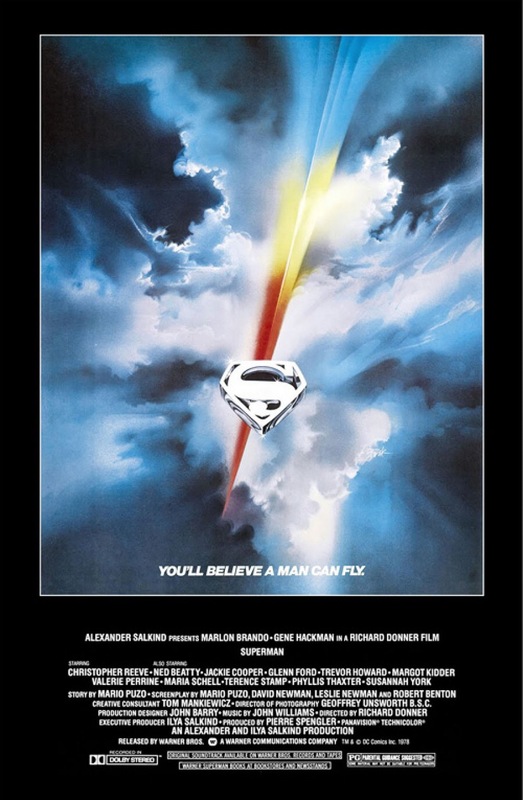 In addition, the same deus ex machina ending is used by Superman at the end of this film- reversing time- as it was originally intended for Superman II but ultimately used in Superman. That’s all fine and good, but as a result it doesn’t really work when this film is viewed back to back with the first. Some describe this cut as nothing more than a “curiosity,” but for me, I am thrilled that this cut of the movie was released. I found it so refreshing to have the goofy Richard Lester scenes excised, making for a much stronger overall movie than the theatrical cut, raw footage and all. Donner deserved an opportunity to realize, to some degree, his vision for the film, and we the fans deserved to see it. Could it possibly be anything else? In 1978, Richard Donner created a vision that all others have drawn from since, and Christopher Reeve made us believe a man could fly. Donner was the first to ever take superheroes on film seriously, and created something more than what had been weekday afternoon kids fare up to that point. It featured revolutionary special effects for its day and a cast that has become legendary. Marlon Brando and Gene Hackman were Academy Award winning actors, Mario Puzo was an Academy Award winning screenwriter, and Christopher Reeve became a name synonymous with the character he played. One could make the case that, even today, the film is the best Superman we’ve gotten outside the comics, and maybe ever. If you’re a Superman fan, you love this movie. Simple as that. There was a brief release of the theatrical cut of Superman: The Movie last year for the movie’s 40th anniversary which I was privileged to catch, and had never seen before. There was also a Blu-Ray release of the never before seen TV version last year, which clocked in at a little over three hours and was also fantastic. My favorite version of the film though, is probably the director’s cut released in 2000 when the movie first came out on DVD. This cut features about twenty minutes not released in the theatrical, and unlike the three hour TV release, the extra footage in this cut is germaine to the story and enhances the overall viewing. Each cut has its own merits but I’ll go with the DVD release as my favorite Superman movie of all time. That’s the list! Agree? Disagree? Let me know in the comments section! Thanks for reading!